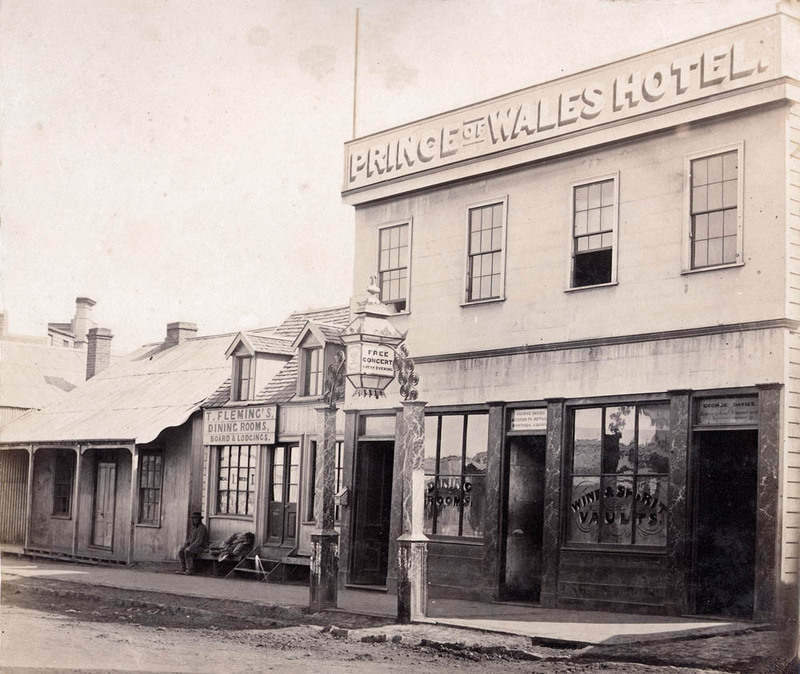 The Prince of Wales Hotel in 1864, photographed by Daniel Mundy. Lettering on the lamp reads ‘Free Concert Every Evening’. Image: Toitū / Otago Settlers Museum. 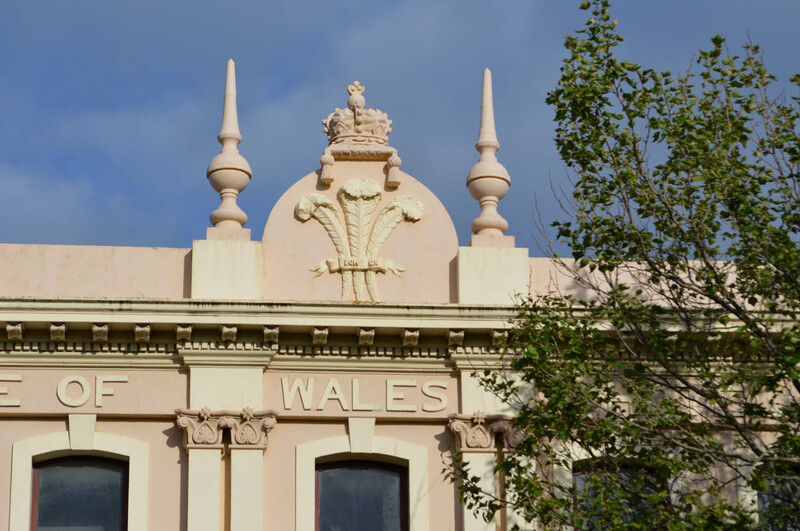 George Davis opened the original Prince of Wales Hotel, a two-storeyed timber building, in 1862. 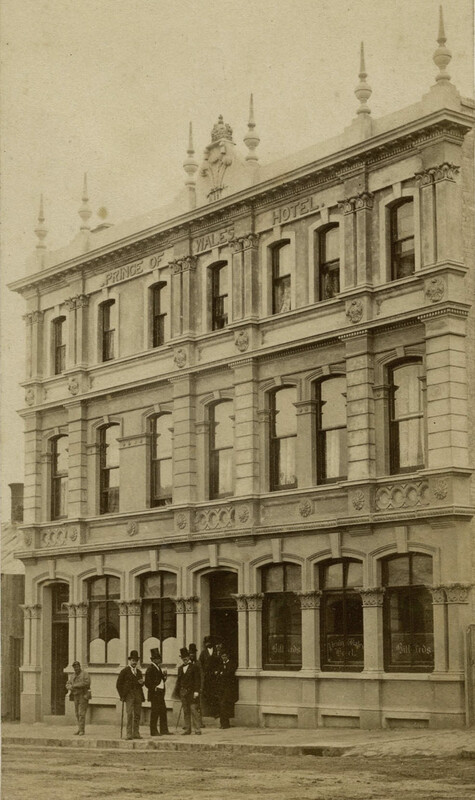 Davis had previously run the Spread Eagle Hotel in Melbourne and his new establishment had a bar parlour, dining room, two parlours, taproom, kitchen, sixteen bedrooms, and stabling for six horses. A concert room was at the rear, and the license allowed opening till ten o’clock. One concert in 1864 featured songs, glees, local sketches, and burlesques performed by Miss Annie Hall (billed as the Yorkshire Nightingale and dialect vocalist), J. Hull (Dunedin favourite and local composer), Mr Francis (talented vocalist), and E.F. Morris (inimitable comic vocalist and duettist). The hotel was rebuilt in 1876 for Robert T. Waters and Catherine Ryan to the design of architect David Ross and re-opened on 18 October that year. The ground floor housed a billiard room, dining room, two bars, bar parlour, hall, and kitchen. On the first floor were another billiard room, two parlours, and three bedrooms. The second floor accommodated eleven rooms used as bedrooms and parlours. Outbuildings comprised sheds, kitchen, sculleries, and servants’ bed-rooms. The building contractors were Forrest & McGill, and the partner Robert Forrest would later design many hotels himself, including the Excelsior and the St Kilda. The Prince of Wales has a bluestone basement and outer ground floor walls. Other walling is brick and the street front is cement plastered and decorated in the Italian Renaissance Revival style. The circular motifs, banded rustication, and to a lesser extent the rosettes, are recurring elements in Ross’s designs. Prince of Wales feathers in relief and a crown sculpture feature prominently on the parapet pediment. Other features include paired pilasters with Corinthian capitals, recessed panels, and finials (once removed, but later reinstated). The overall composition is slightly asymmetric, with the bay to the left of the centre being wider than the one to the right. The hotel not long after it was rebuilt in 1876, and before the addition of fire escapes. Image: Toitū / Otago Settlers Museum, 26-32-1. Advertisement following refurbishment in 1886. From Otago Witness, 19 November 1886 p.18 (Papers Past, National Library of New Zealand). When the main trunk railway between Dunedin and Christchurch opened in 1878 a large transparency by the artist Thomas Nicholson was placed above the entrance of the hotel as part of the street decorations. This included a portrait of Sir Julius Vogel, who as Colonial Treasurer had initiated massive public works schemes through overseas borrowing. The words ‘Advance New Zealand’ appeared on either side of the portrait, with a locomotive and carriages beneath along with the inscription: ‘Success to the Iron Horse’. It was reported in the Oamaru Mail that a Member of Parliament who stayed at the hotel found the eyes of the portrait (illuminated by gaslight or sunlight outside) staring into his room. He said: ‘Oh, that the original only possessed half the transparency of the representation’. On the ground floor is the bar — well supplied with liquors of the most approved brands, the bar parlour, and, to the back, a well designed commercial room. Opposite to the bar is the cafe — a large apartment — furnished in the style signified by the name, and duly provided with newspapers, time tables, and other literature of a suitable sort. Behind is the dining room, a spacious hall, lighted from above, and where guests at choice may have their meals at a table d’hote, filling the centre of the room, or at small tables set around the walls. On the opposite side of the passage is a retired sitting room where business requiring isolation and quiet may be transacted. The hotel has had its tragedies. In 1914 a young Scotsman named Hughie Stewart shot and killed himself in one of the upstairs bedrooms. His love for a barmaid at the Gridiron Hotel, on the opposite side of the street, had been unrequited. The woman refused to marry him because he was Presbyterian and she was Catholic. The note the man left quoted Tennyson: ‘Tis better to have loved and lost than never to have loved at all’. Not long after this came the horrors of the First World War. The publican’s son, James Andrews of the New Zealand Rifle Brigade, died of wounds in France in 1916. Carnarvon Station, a railway-themed restaurant which included an authentic Victorian railway locomotive and carriages, opened in 1980. Although its entrance was from the old hotel, the restaurant proper was in an adjoining building. The restaurant closed in 1988 when it was gutted in a severe fire which also damaged the Prince of Wales building. Michael Coughlin’s restaurant Bell Pepper Blues opened in 1992 and remained until 2010. Coughlin said that the name of the restaurant combined his interests in southeast American cooking and blues music (referencing Eric Clapton’s ‘Bell Bottom Blues’). Food writer and restaurant reviewer Charmian Smith described Bell Pepper Blues as Dunedin’s highest profile fine-dining restaurant. Coughlin is now chef of the Pier 24 restaurant at St Clair, and there is no bar or restaurant on the Prince of Wales site. A second-hand goods shop, Bob’s Place, opened in 2013. 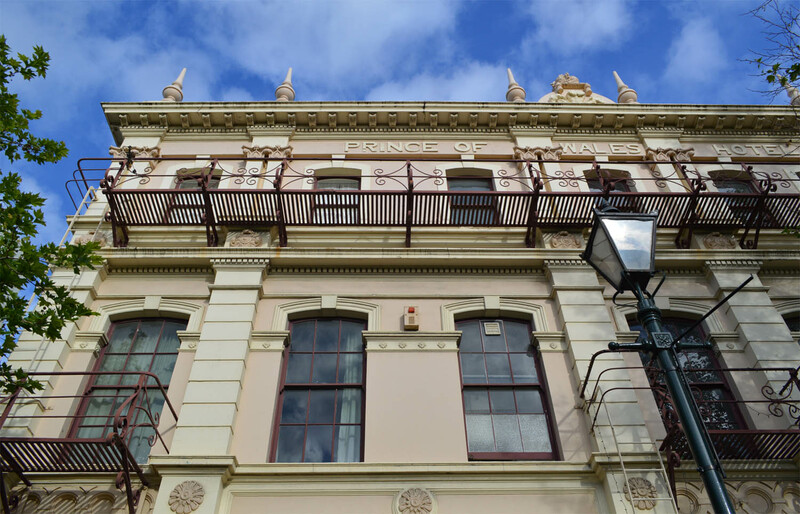 It still faces the street with one of Dunedin’ finest and most intact nineteenth century hotel facades. To finish, the list below names licensees from 1862 to 1984 and is based on earlier compilations by R.W. Willett and Frank Tod. Adjustments have been made from references found in newspapers online (through the Papers Past website). 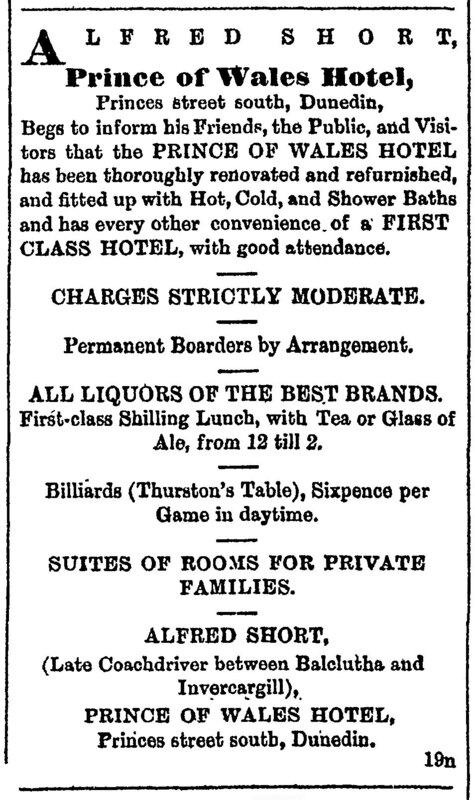 Otago Daily Times, 16 April 1862 p.3 (description of original hotel), 11 September 1863 p.8 (advertisement), 30 March 1864 p.6 (advertisement), 19 October 1876 p.3 (description), 7 September 1878 p.3 (decorations), 14 May 1914 p.8 (Hugh Stewart), 1 July 1988 p.1 (Carnarvon Station fire), 15 January 2010 (‘September swan song for Bell Pepper Blues’); Oamaru Mail, 20 September 1878 p.2 (Julius Vogel); New Zealand Tablet, 11 January 1895 p.19 (promotional piece); Star Weekender, 6 April 1980 p.28 (Carnarvon Station opening). This entry was posted in Buildings and tagged 1870s, David Ross, Forrest & McGill, Hotels, Princes Street, Renaissance revival, Robert Forrest, Victorian on 23 September 2013 by David Murray.